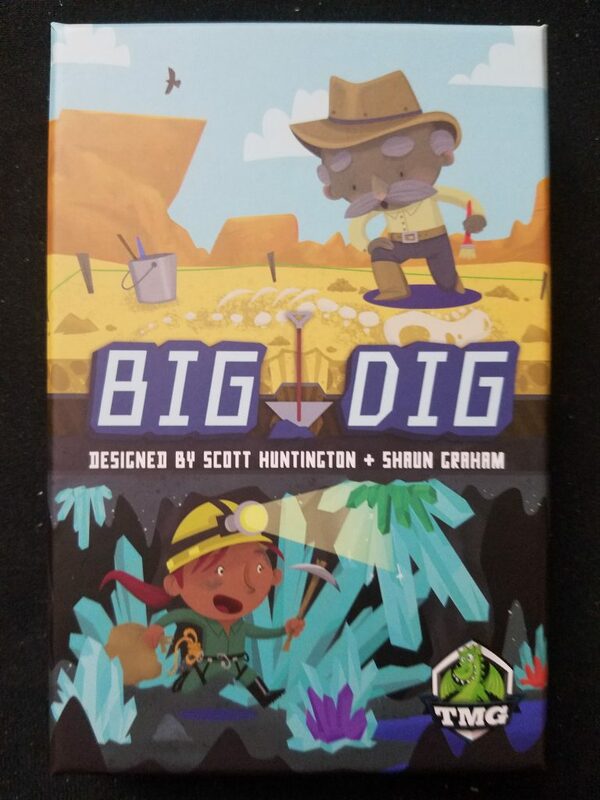 Just look at the box cover of Big Dig and you’ll see why I jumped on a chance to review it. That woman is so excited she’s running recklessly with a pickax. No one’s ever been that happy in a cave. The dude up top looks like he’s bemused to have accidentally uncovered an entire dinosaur skeleton. The art and design by Nate Call and Katie Welch is undeniably charming, and it’s a roll and write game, the undeniably charming game genre du jour. The charm lasts until you actually start playing the game and you realize you’re not doing much at all. 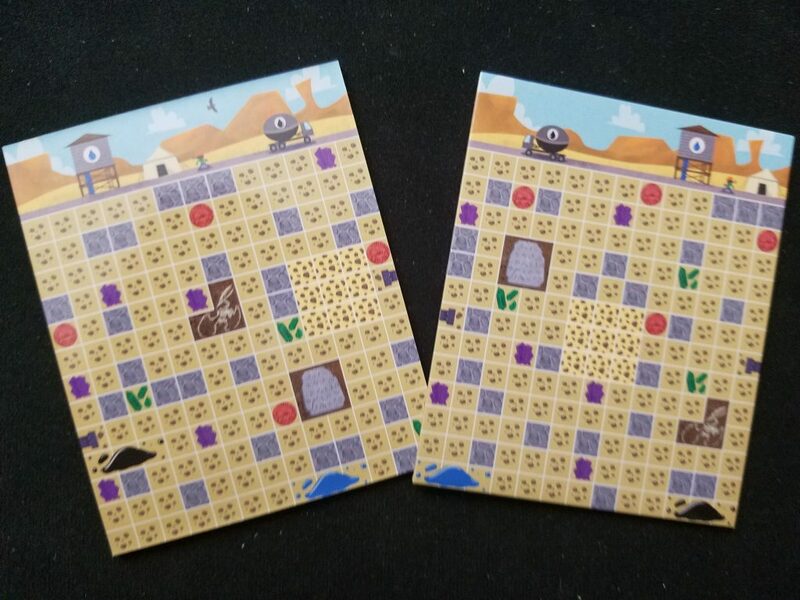 You’re given a cute little board and a cute little dry erase marker, and each round you’re going to select a tetris-like shape from a selection of cards and cross out squares on your board in accordance to that shape. There are three randomly selected goals (all variations of “cover up things” or “draw a line between two points”) and everyone’s racing to accomplish all three first. Everyone has the same board so it’s just a matter of economizing actions, right? The problem is that all of the shapes you’ll be using are roughly the same size, and even when you find yourself without any choice (which is bad but really the only source of tension in this game) you can usually figure out a way to use the shape decently. There’s supposed to be some play, I suppose, in intentionally saddling people with shapes they won’t want. But as we all know, that only works best in a two player game where it’s zero sum. Even then there’s so much space to maneuver with all of the goals that I find myself not caring much about trying to interact with my opponents at all. 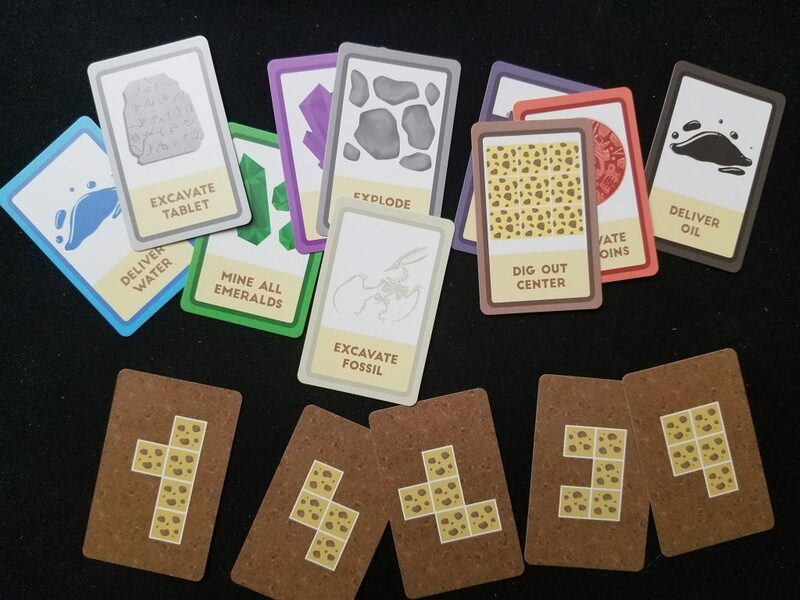 The choice of which card to take involves some thought, I guess, though the heuristic is dirt simple: choose the shape that lets you fill in the most squares that you need to fill in. As a family game I suppose there could be some spatial reasoning fun to be had with the little ones, but parents, really, you can find better. I guarantee it. Finally, when you get to the end game where blocking is actually viable, your choices will be either completely straightforward and/or simple kingmaking. There’s also a potential first player advantage since this is a race where everyone is going forward at basically the same rate; each shape fills in 4-5 spaces and 3-5 will progress towards one of the goals. People watch NASCAR for the crashes and the silly drama, not for all the cars moving around at the same speed. Big Dig is certainly the latter. In the parlance of parents everywhere, I’m not mad, just disappointed. When I play Big Dig I want to reach out and find a game somewhere, anywhere, but I only grasp at air. Where are the decisions that matter? Where’s the tension? Where’s the sense of accomplishment or progression or cleverness? Big Dig is all surface shine–there’s nothing underneath. +The box is a proper size?